I've seen this meme on Twitter, on Instagram and on Facebook in the past few days - you may have seen it too, if you spend any time on social media. 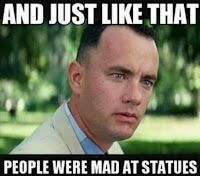 It's just one of several making the rounds these days, post Charlottesville, when self-proclaimed neo-Nazis, white supremacists and white nationalists from Union states and Confederate states gathered, with first with torches, and then with helmets and shields and clubs and a well-armed 'militia' of supporters to protest against the removal of a statue of Robert E. Lee. I can't help thinking that the people who thought the original meme was funny would not think the same of the one to the left; would you agree? Would we see a lot of high fives and "damn straight" and "exactly"and similar comments on this? 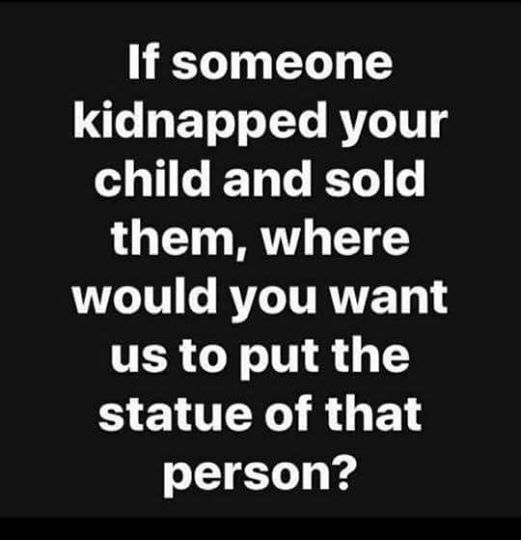 From my middle-aged white lady perspective, people (on both sides) don't care about the statues per se - certainly not because "the beauty that is being taken out of our cities, towns and parks will be greatly missed and never able to be comparably replaced!" 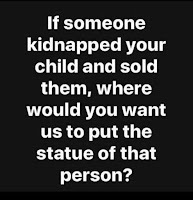 People do care, deeply, about what the monuments symbolize. And what they symbolize, if we are to believe the ones who protest in their favor, is a white heritage, where blacks are not taking over our country, where Jews are not replacing them, and where, it seems, whites would not be failing in procreative department, and would be popping out babies left and right to ensure that the white race does not get trampled by blacks, browns, and yellows. And, they symbolize a country where whites are in control "culturally, politically, socially - everything. We define what America is." Because in our lifetimes - for Pete's sake, I'm only 59, my husband 10 years older - in our lifetimes, America struggled with racism, continues to struggle with racism, a century and a half after the Civil War. Would it surprise you that there have been over 4,000 lynchings in America, from the 1870s to the 1950s? In 1951, the family of 8 year old Linda Brown sued because the child was bused to a segregated school when she lived within walking distance of an all white school; this was the Brown vs. Board of Education case, which was sort of resolved in 1954, when the Supreme Court ruled that 'separate but equal' schools for blacks violated the 14th Amendment - which was adopted in 1868. The Court in 1955 ordered states to integrate their schools (Brown II). And finally, in 1958, the Court ordered desegregation of schools (Cooper vs Aaron case) was required, and that the threat of violence was not a reason for continued segregation. Also in 1955, Rosa Parks was arrested for not giving up her seat on a Montgomery bus to a white man. Several months earlier, Claudette Colvin, a 15-year-old schoolgirl, was arrested for a similar offense. Parks' arrest led to the lengthy Montgomery bus boycott; in 1956 that the Supreme Court ruled that the bus segregation ordinance violated the 14th Amendment. How about voting rights? Blacks were given the right to vote under the 15th Amendment, which was ratified in 1870. The Civil Rights Act of 1957 allowed the federal government to investigate and prosecute cases of voting rights infringement. Later, we had to enact the Voting Rights Act of 1965 to try and eliminate requirements such as poll taxes, literacy tests, and other inhibitors to voting, and also established the practice of federal approval of changes to voting laws in states where discrimination had historically occurred. Overall, at least 99 bills to restrict access to registration and voting have been introduced in 31 states. Thirty-Five such bills saw significant legislative action (meaning they have at least been approved at the committee level or beyond) in 17 states. Federal courts have called out in gory detail the extent to which several of these laws are driven not by any sense of urgency for protecting the sanctity of the ballot, but rather to limit the ability of blacks to vote. In the 1950s and 1960s, African-American churches were regular targets of violence, including one incident in September 1963 that killed four schoolgirls. It didn't stop in the 1960s. In fact, Congress passed the Church Arson Prevention Act in 1996. Not 1966, folks - 1996. And it didn't stop then, either. 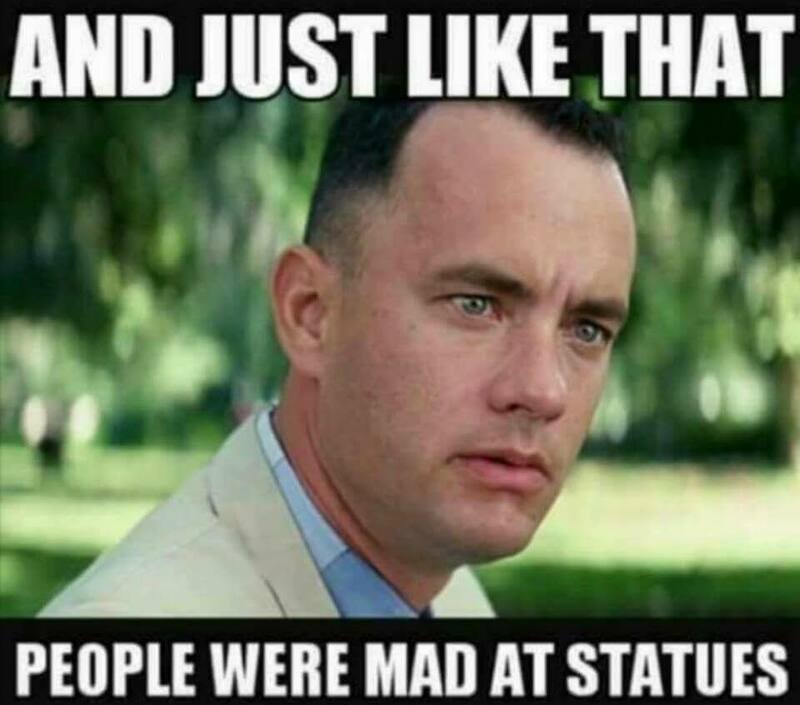 Yes -- in my lifetime, and yours, America has had issues with racism; we have issues with racism today, and we will continue to have issues with racism in the future, if we pretend that it's just the symbols that people are upset about. It won't go away if we pretend it doesn't matter or doesn't impact us. It won't go away if we pretend the problem is violence, not racism. It won't go away if we pretend that speaking out against racism is the flavor of a day, rather than the flavor of several generations. It won't go away unless we want it to.